Perhaps one of the most important – and, ironically, quickly forgotten – speeches made at the National Press Club was on July 19, 1962, when Martin Luther King Jr. was the first African-American speaker at a luncheon forum. He came to the Club fresh from a protest in Albany, Georgia. He had refused to pay a fine and been sentenced to jail for his part in leading the civil rights protests to end legal segregation and demand voting rights. Instead of spending 45 days behind bars, he appeared at the Club's podium because his fine had been paid by a secret white supporter, who later was revealed as evangelist Billy Graham. The speech came at a critical time in the civil rights movement when King’s non-violent approach was being questioned by younger black leaders who believed it could not work. King spoke at length about the philosophy and where it was heading. “Those who adhere to the method of nonviolent direct action recognize that legislation and court orders tend only to declare rights. They can never thoroughly deliver them,” he said. “A catalyst is needed to breathe life experience into a judicial decision by persistent exercise of the rights until they become usual and ordinary in human conduct. 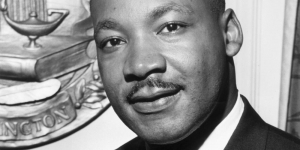 King’s response detailed his view of just laws and unjust laws. “An unjust law is a code which a majority inflicts on the minority which is not binding on itself,” he said. “This is difference made legal. A just law is a code that a majority compels the minority to follow which it is willing to follow itself. This is sameness made legal. I would also say that an unjust law is a code which a majority inflicts on a minority which that minority had no part of enacting or creating because it was denied the right to vote." In the history of the civil rights movement, the speech itself was largely overlooked. Not until 2015 did the Club’s History and Heritage Committee decide to unearth it from the Library of Congress archives, where tapes of all Club luncheons from 1953 to 1991 are stored, and allow it to be heard again during a special Club presentation in January 2016. Club President John Hughes of Bloomberg arranged for a historic plaque to be placed at the entrance to the ballroom commemorating the speech. King’s second appearance at the Club was scheduled for April 9, 1968, when he was slated to talk at a new series of forums called “Town Meetings.” Instead, that was the day he was buried as Washington reeled in the aftermath of his assassination. To find a transcript and a recording of the speech, as well as of a program the Club put on in 2016 to commemorate the speech, go here. This is another in a series provided by Club historian Gil Klein. Dig down anywhere in the Club’s 110-year history, and you will find some kind of significant event in the history of the world, the nation, Washington, journalism and the Club itself. Many of these events were caught in illustrations that tell the stories.